While many companies are showing off their latest and greatest products here at Computex Taipei 2013, one of the companies showing off an extra cool piece of kit here is ADATA. Now, we generally don’t cover enterprise drives often, but with ADATA’s new line of enterprise SSDs, one particular drive caught my eye – the ADATA SX2000. As you can see above, the casing on the SX2000 makes it look like a typical SSD, but what first caught my eye is the crazy capacity and formfactor – 1,600GB (1.6TB) on a 2.5″ drive. Now high capacity SSDs do already exist in the enterprise market, but what makes this drive extra special is in the spec sheet. 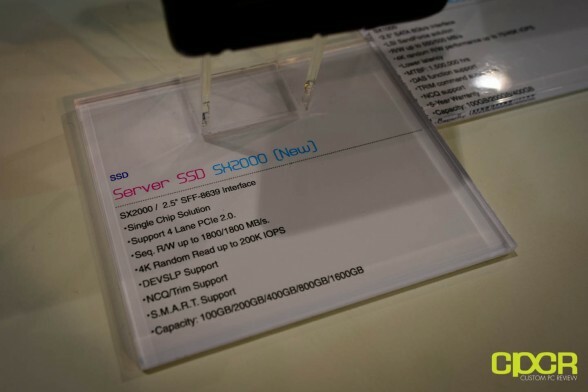 Taking a look at the specs then, we can see that ADATA is claiming sequential read/write speeds of up to 1,800MB/s and 4K random reads up to 200K IOPS! 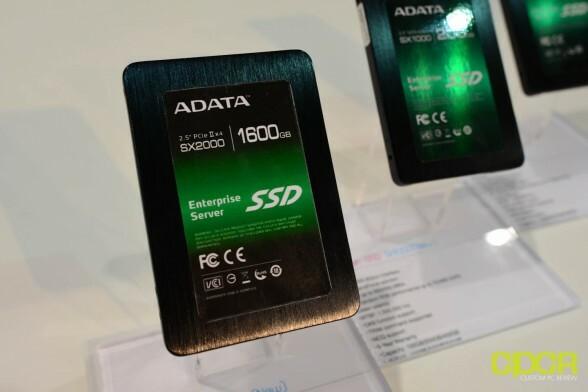 Now for those who are familiar with SSDs and the SATA interface that consumer SSDs generally run on, it’s currently limited to 6Gb/s, which translates to around 600MB/s in a perfect world – nothing remotely close to the 1800MB/s number advertised by ADATA. However, looking at the interface used on this specific drive, we can see that it’ll be running on the SFF-8639 x4 PCIe 2.0 interface, which is capable of reaching theoretical maximums of about 2.0GB/s. Now, PCIe SSDs already exist and are capable of reaching such performance. Companies such as OCZ for example have been making PCIe SSDs with multiple SandForce controllers that are capable of breaking the 1TB/s barrier, but what’s special about the SX2000 is that it uses a “single chip solution”. Speaking to an ADATA rep for more information, we’re told that the SX2000 will be using a next generation controller from LSI SandForce. While they weren’t able to provide specific information on the controller, they were referring to the controller as “Griffin” and they’re telling us that it should be out sometime in Q4 this year. Up until now, we’ve been expecting a new controller from LSI SandForce to replace the aging SF-2200 series, but haven’t had any solid details… until now. Looks like the SSD sector is going to get a lot more exciting! Stay tuned for more!